As a kid I was captivated by the mysteries of U.F.O.s, Bigfoot, the Loch Ness Monster, ghosts and other paranormal doings. I grew up watching the television series “In Search of…” hosted by Leonard Nimoy and read whatever books I could about unexplained phenomena. Yeah, I was some sort of geek/desk-bound adventurer. But somewhere deep down there remained that childlike spark of curiosity and wonder about things that do not fit our orderly understanding of the world. That spark was fanned into a flame recently when I read a Facebook post by a former colleague at The Press-Republican, Lohr McKinstry. 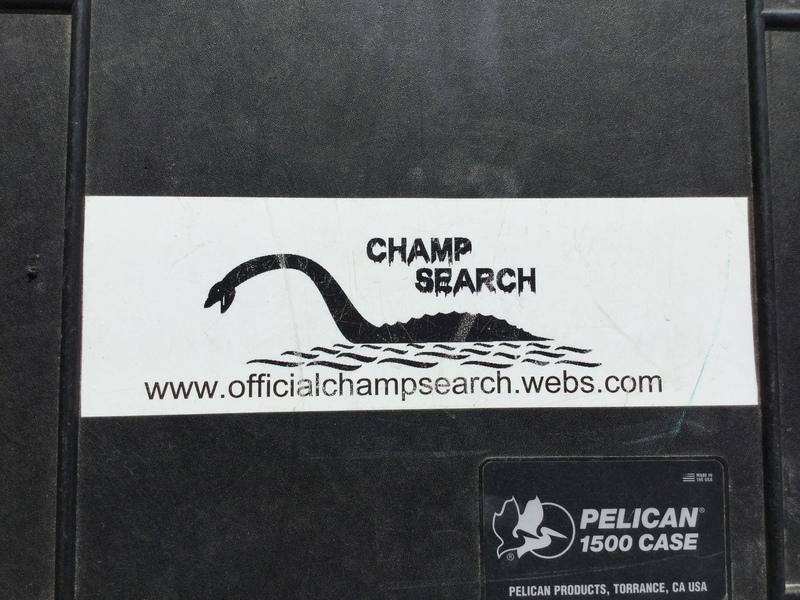 He posted that he was donating a trove of his articles about Champ, the often-reported, sometimes-documented but never-authenticated mystery creature of Lake Champlain, known as the Loch Ness Monster of North America. That led me in June to spend some time in Vermont with Katy Elizabeth, the lead researcher and founder of Champ Search, which is dedicated to proving the existence of Champ and protecting it. Katy Elizabeth unpacks equipment from her car, preparing for a day’s searching on the lake. From my time working at The Press-Republican, I was aware of the legend. Sightings of Champ stretch back centuries to when Indian tribes populated the area and continue to present day. Some early accounts described it as serpent more than 100 feet long though Elizabeth believes it might be an amphibian/reptile hybrid that is between 15 and 30 feet long, with knobs on its back, a long, slender snake-like neck and head shaped like a horse. Skeptics believe the sightings can be attributed to gar, sturgeon, schools of fish or even logs. Me? I was just excited to shadow Elizabeth in her work. Over the years I’ve grown to appreciate people who see the world differently because they open up new horizons. Plus, I have all the admiration and respect for anyone who is passionate about their work! 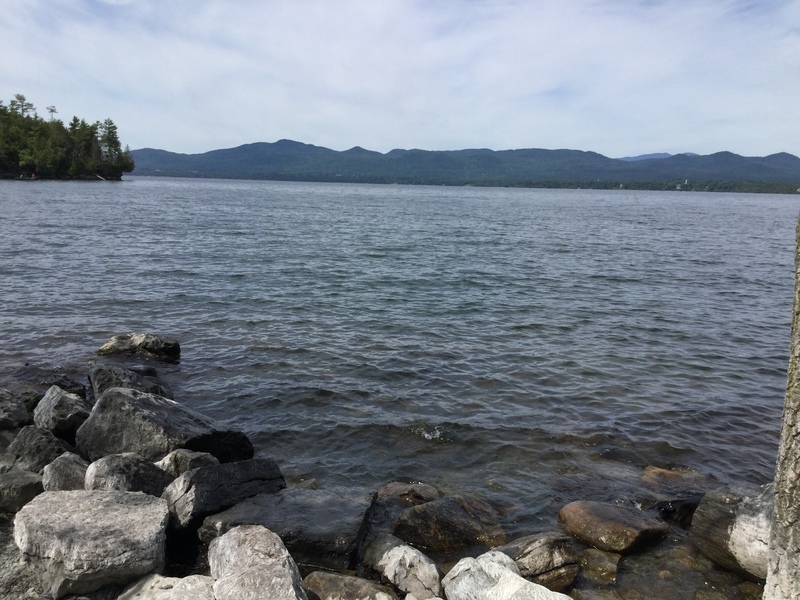 It was like going on a ghost hunt with all the spectrometers and other paranormal-measuring equipment except instead of looking for spirits in the basement of an abandoned hotel, I’d be outdoors on the shore of Lake Champlain. Elizabeth, 33, who is known among locals as the “Champ Lady” or the “Lake Monster Queen,” got turned onto Champ when she was 7. She was watching an episode of “Unsolved Mysteries,” which featured an episode about the creature. She got hooked and has been ever since. She will get up before sunrise and spend two to four hours staking out the lake and then return at sunset, the theory being that Champ is nocturnal. 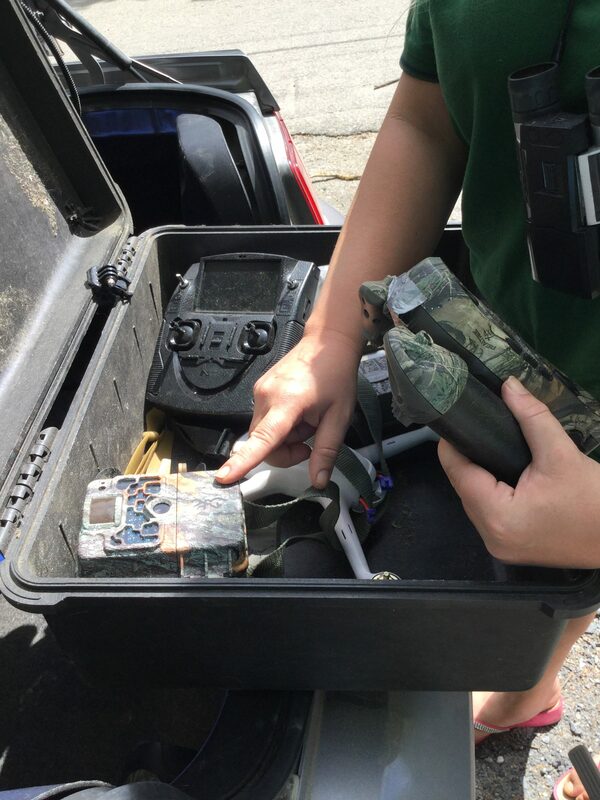 The trunk of her car is filled with hard plastic containers with hydrophones with a recorder and underwater microphone, binoculars, camera and tripod. Among the assorted equipment she relies on in her search efforts. “You are not going to see something every day, but when you do, it’s an amazing experience,” she said, adding that patience and staying open to possibilities are critical. 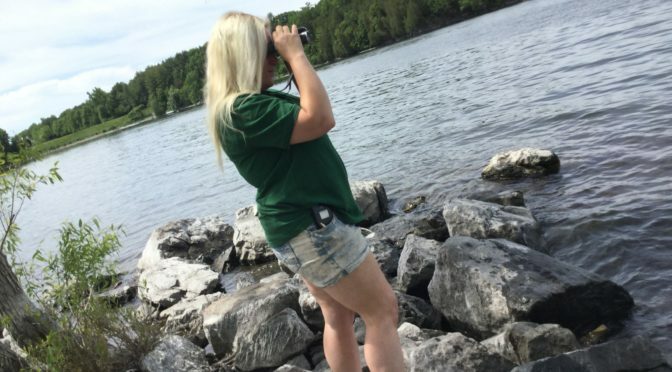 Elizabeth, who grew up in Rhode Island near water, said she is a trained observer of lakes and seas and can readily distinguish logs, fish and boats from other objects on the water’s surface that are not readily explained. Some of the things she told me about Champ were a surprise. For instance, though “Champ” is often referred to in the singular, it really is “Champs,” as in a whole school of them. She described the creatures as “a very tough species of animals” given how they have survived the sewage and other pollution that has gone into the lake over the years. The other thing that surprised me was that there have been reported sightings of Champ on land! She regularly scours the shoreline searching for teeth, bones or other physical traces of Champ. In one case she found a bone of an ancient bison, a conclusion she said was backed up by a natural history museum in Ohio that examined the relic. “It’s really cool to find stuff like that to remind you how ancient this area is,” she said. Tripod and camera at the ready, Katy Elizabeth regularly scours the lake on the search for Champ. She said some species know when their death is imminent and seek hidden places to die. And with Lake Champlain being 120 miles long, there are a lot of places of hide. Elizabeth herself has had more than a dozen encounters with Champ, garnering her five different videos and four or five audio recordings. Some of the sounds might be territorial calls, she said. She attributes her extraordinary number of sightings to a heightened sensitivity to paranormal elements. Elizabeth hopes to earn degrees in marine biology and marine bioacoustics but in the meantime relies on her own self-taught methods and research. While some “armchair researchers” will either merely talk about the search for Champ or put in a perfunctory effort, Elizabeth said she is dedicated full time to finding proof of its existence. But her work will not stop there. Such a discovery would open up Champ to study similar to tagging sharks or whales and learning more about their behaviors and characteristics. On the day of my visit, we were at Arnold Bay on the Vermont side, looking across the lake at Westport and Port Henry in New York. Apart from a father and daughter fishing, I didn’t see any activity on the lake. I’m a skeptic by nature (and training) but it’s difficult, after talking at length to Elizabeth and hearing her passion and enthusiasm for her work, not to discount the possibility that something unexplained lurks beneath the surface in Lake Champlain.